Lots of recipes for chicken and cheese empanadas use ready-made dough. Not this one! This how-to video shows you how easy it is to make 'em from scratch. Combine flour, baking powder and salt in medium bowl. Cut in shortening with pastry blender or 2 knives until mixture resembles coarse crumbs. Gradually add 1/4 cup water, stirring until mixture forms ball. Knead dough on lightly floured surface 5 min. or until smooth and elastic. Wrap tightly in plastic wrap. Refrigerate while preparing empanada filling. Cook chicken, onions and peppers in nonstick skillet on medium-high heat 5 min. or until chicken is no longer pink. Add salsa; cook and stir 2 min. Cool completely. Heat oven to 375ºF. Divide dough into 6 pieces; roll out each piece on lightly floured surface to 7-inch round. Place in single layer on parchment-covered baking sheet. Stir cheese into chicken mixture; spoon about 1/2 cup onto half of each dough round. Beat egg and remaining water until blended; brush onto edges of dough rounds. Fold dough rounds in half to enclose filling; press tops lightly to remove excess air. Seal edges with fork. Brush with remaining egg. Bake 18 to 20 min. or until golden brown. 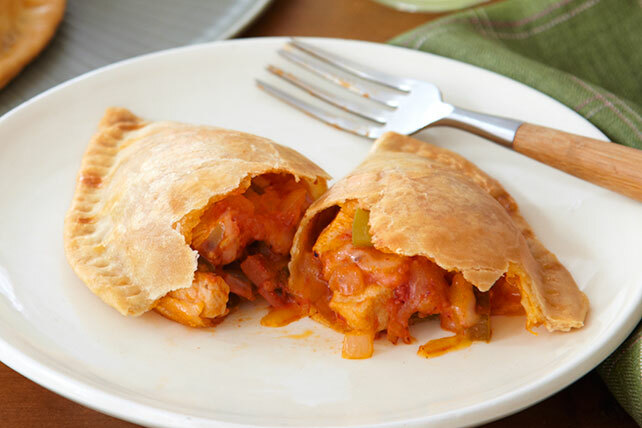 Share these delicious empanadas with friends and help each other stick to the serving size. If empanada dough is too dry, add additional water, 1 tsp. at a time, until dough can easily be shaped into ball. These delicious empanadas can be assembled ahead of time. Place in single layer on parchment-covered baking sheet. Refrigerate up to 24 hours. When ready to serve, bake as directed. Substitute 6 thawed frozen empanada dough disks for the homemade dough. Prepare recipe as directed, substituting lean ground beef for the chicken and 1/4 cup KRAFT Original Barbecue Sauce for the salsa.